All large cruise ships berth at the island's only major pier, officially named after a former Public Works Commissioner, Ann E. Abramson. The pier is 1,526 feet long, allowing two cruise ships to tie up at the same time. A kiosk filled with tourism information sits at its head. Public restrooms are nearby. While the pier is the gateway to shopping in Frederiksted, taxis and tour buses take visitors to Christiansted for shopping, sightseeing, and on round-the-island tours. Shuttles are around $ 16. This dock is in the center of town. You could hang out on one of the pretty beaches within easy walking distance of the pier. In Christiansted, smaller cruise ships pull in at the Gallows Bay Dock, which is about 1 mi/1.6 km east of town. St.Croix's rich culture and history, along with its beautiful beaches and world-class recreational activities, create an experience unlike any other in the Caribbean. Since the day Christopher Columbus first arrived at Salt River on St. Croix more than 500 years ago, sugar and rum have shaped the island's life and land. Fifty-four sugar mills, each with imposing windmill towers and factory chimneys, still rest in the shadows of stately eighteenth-century and nineteenth- century homes. Located on the west end of the island, Estate Whim Plantation is just one example of these "great houses." With acres of rolling green hills, St.Croix's plantation estates also bore crops of okra, cabbage, corn, and other vegetables still prominent in Caribbean cuisine. As the sugar industry declined after the 1960s, tourism became the most important industry on the island. 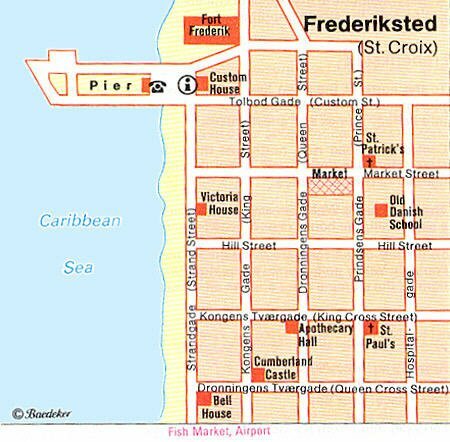 Christiansted and Frederiksted, the two main towns of St. Croix, flourished as commercial ports during the eighteenth century and nineteenth century. Distinct architecture reflects the seven flags--Spanish, Dutch, British, French, Knights of Malta, Danish, and American -- that have flown over the island. Today, visitors to St. Croix can enjoy a number of indoor and outdoor activities, from fine dining, shopping, and a casino, to golf, scuba diving, and horseback riding. The Cruzan Rum Distillery, in operation for over 300 years in the same location is home to one of the world's finest rums. The distillery (formerly known as Estate Diamond) offers guided tours of the facilities that explain the distillery process, the importance of rum in the island's history, and the story of the estate grounds. On the pier, you can buy tickets for the shuttle buses that run across the island to the quaint capital Christiansted. An intriguing combination of tropical charm and European heritage, Christiansted has a great setting and is home to a beautifully restored Danish fortress. A taxi to Christiansted will cost about $25 for two people. Getting around any of the Virgin Islands is fairly easy. All of the islands have bus service and/or a regulated taxi service. You can "bargain" for most things on the islands, but the taxi and bus rates are regulated. Taxi rates are charged per person one way. Also consider renting a car. Traffic is however "on the left"
Buck Island National Reef Monument, an 880-acre nature preserve, boasts an underwater snorkeling trail that has become one of the most popular attractions in the U.S. Virgin Islands. Visitors are ferried by boat to the island one mile northeast of St. Croix to view the stunning array of coral and sea life. The best (duty-free) shopping is in Christiansted, where most stores are in the historic district. Stores are mostly closed on Sundays. English is the official language but you may also find Spanish being spoken. Free wifi at many places. Shopping hours Mon-Sat 0900-1700. When cruise ships are in port, some larger shops open on Sunday. 6 Jan Three Kings' Day. Jan Martin Luther King Day. Oct Virgin Islands Thanksgiving Day. 1 Nov D Hamilton Jackson Day/Liberty Day.